Five aging friends decide to ditch assisted living and move in with each other in the crowd-pleasing comedy All Together, starring screen legend Jane Fonda. 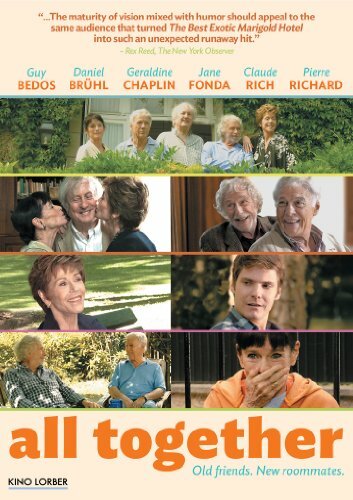 When elderly lothario Claude (Claude Rich) is put into an old folks home, his friends bust him out and start a cranky commune together, thinking they can care for each other better than anyone else. New York, NY - March 15, 2013 - Kino Lorber is proud to announce the DVD release of All Together , a comedy directed by Stephane Robelin and starring Guy Bedos, Daniel Bruehl, Geraldine Chaplin, Jane Fonda, Claude Rich and Pierre Richard. The film, which Kino Lorber released theatrically last year, comes to DVD with a street date of March 19th, and a SRP of $29.95. The DVD is presented in 5.1 Dolby Digital Surround, and includes trailers and a stills gallery as special features. Five aging friends decide to ditch assisted living and move in with each other in the crowd-pleasing comedy All Together, starring screen legend Jane Fonda. When elderly lothario Claude (Claude Rich, The Bride Wore Black) is put into an old folks home, his friends bust him out and start a cranky commune together, thinking they can care for each other better than anyone else. Fonda heads the brilliant cast that also includes Geraldine Chaplin (Doctor Zhivago), Pierre Richard (La Chevre) and humorist Guy Bedos. The group is joined by a young graduate student (Daniel Bruehl) who films their experiment for his research project, while also acting as a de facto caretaker. They all discover the joys of communal living, at least until old jealousies and the infirmities of age begin to pull the group apart. Kino Lorber curates high quality, critically-acclaimed films for discerning audiences - delivering the classics of yesterday and tomorrow.